I look forward to your stop on the blog tour. 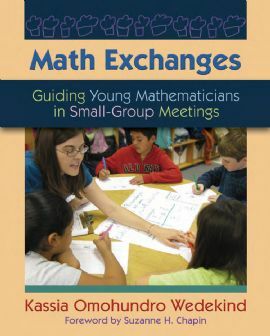 Even though I do not teach math, I have been interested in learning more about math workshops, so I was excited to see your post as well as Kassia’s blog. Thank you for suggesting Math Exchanges. I found it with your link and read quite a few pages online. I can really see the connection between the workshop/small group approach in both literacy and math. It’s what I’ve been searching for in my math instruction but have been able to find. I’m looking forward to reading more from Ms. Wedekind’s book. Love all the completely different and unique ideas! I am finding more and more that there are so many connections to literacy when teaching math. I am falling in love with teaching math as I take a workshop approach in my own classroom. I can’t wait to read the book and check out the blog tour! Looking forward to the blog tour and interacting with your readers.Thanks for hosting it, Katie and Pat!